The polished rock pictured above is true onyx. Onyx is a form of quartz called chalcedony (what a great word) that's usually associated with volcanic activity. As a form of quartz, chalcedony is composed of silica. It's formed when water dissolves silica to the point of saturation. What precipitates out of the saturated solution is chalcedony. Chalcedony, or true onyx, is a semi-precious stone that's used primarily to make jewelry. The materials I'm showing above are sold as onyx, but they are an unrelated stone. Repeat, they aren't really onyx. That certainly doesn't distract from their beauty, but knowing what things are is important. The stones shown above are a form of calcite called sinter. If you go to a stone yard and ask to see a slab of sinter they will look at you like you have three heads, so play along and call it onyx. Sometimes, knowing something and keeping it to yourself can be really satisfying. 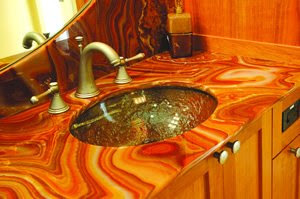 Sinter, or commercial onyx is formed from calcite in a way similar to how travertine is formed. Water dissolves calcite from limestone to the point of saturation and what precipitates out of that solution will form either sinter or travertine depending on a couple of factors. 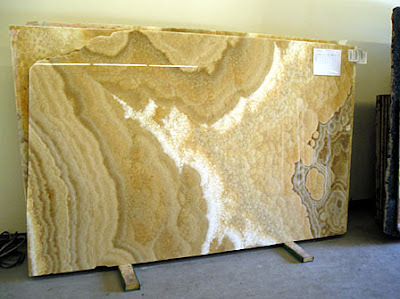 If there are air bubbles present at the time that the calcite gets deposited then the resulting stone will be travertine. If there are no air bubbles, then the resulting stone will be sinter, or commercial onyx. If you've ever been in a cave, the stalactites and stalagmites are made from calcite and if left to form large enough deposits, they may end up as a vanity counter several thousand years in the future. What this means too is that this material is a sedimentary rock. 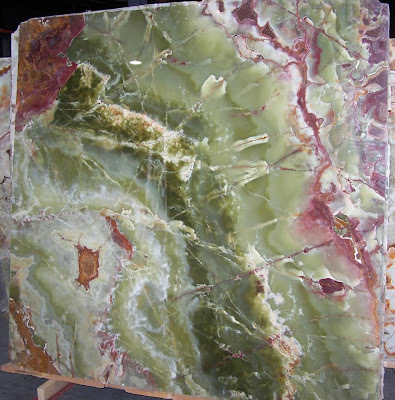 Of the three types of rock (igneous, metamorphic and sedimentary), sedimentaries are almost always the most fragile and commercial onyx is no exception. It can't handle everyday stresses and it is very easy to chip and crack. 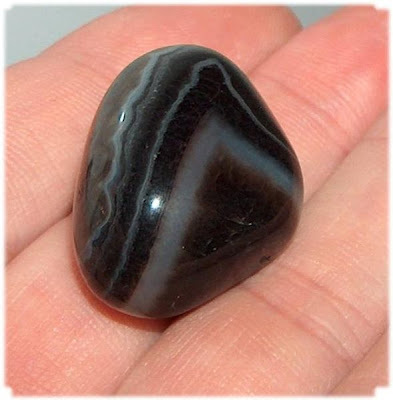 People who don't know any better sell this stuff as real, silicaceous onyx. If it were silica-based, it would wear a lot better than this material actually does. Keep in mind that it is as high maintenance as travertine. I think travertine's gorgeous, it's my favorite flooring material. But I wouldn't put it on a counter if you put a gun to my head. It can't handle heavy traffic or exposure to acids. It's extremely porous and makes a pretty lousy kitchen surface. Besides, most of it is supremely busy and a little of it goes a long way. In the bathroom pictured above, it looks interesting without being overwhelming. But just barely. In the kitchen above it looks like the scene of a grisly murder or a slaughterhouse. 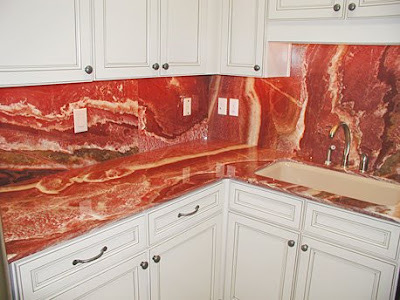 Seriously, it looks like these people have a meat back splash. Ugh. This material is very expensive and as the kitchen above illustrates beautifully, expensive doesn't always mean tasteful. 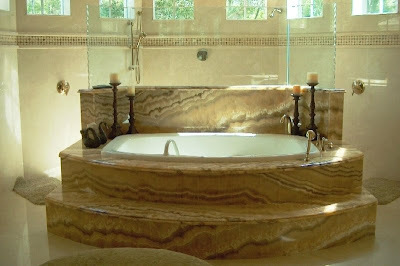 The less garish form shown on the tub surround above is usually called honey onyx. I've used the same material as a desk top in an office and it looked interesting without being too too. Get up close and personal to a slab of the material pictured above some time if you get the chance. It's really interesting. It looks like half crystallized caramel. It's a little too wild for my tastes, but I can't walk past it without stopping. Sometimes, stuff that comes out of the ground is just jaw dropping. Well it does! That counter and backsplash look like a raw hanger steak. The red is actually not an onyx. It's a cheap red and white marble out of Pakistan. We buy it for approx $4/sq ft. I actually know the company which sold the red material. They have been in business for over 30 years - and don't have a clue. They bought the material as onyx and passed their mistake to their customer. This install is one of their "signature installations". It's really a laundry room. Makes me laugh every time I see it. Actually, none of them are onyx and very little of it is appropriate or attractive to use as counter material. And you're right, that red stuff is particularly hideous.